My family although we love chocolate, when it comes to desserts a chocolate dessert is the least requested dessert. A chocolate cake would last me weeks in the refrigerator, so when I make one they eat it the day I make it, then I freeze the rest for another time or for when unexpected guests pop in. So once every two to three months when I come across a chocolate recipe I feel like trying I give it a go to see if my family love it. 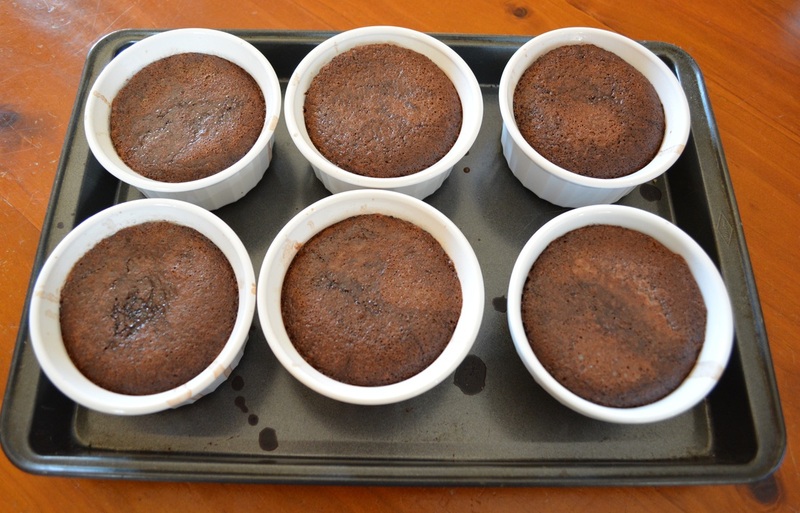 These Chocolate Self Saucing Puddings were a huge hit. I actually made these two days in a row because I wanted to make sure I cooked them just right (so I can post the recipe), and my kids devoured them, they really loved them. Although I initially thought they would be too sweet, they weren't, too rich, nope. They were perfect. The original recipe baked them for only 15 minutes, this to me is not enough, what I got was a small amount of cake on top, but a mass amount of liquid beneath. I wanted more pudding/cake. So the next batch I baked all 6 ramekins for 20 minutes (then I removed 2 ramekins from the oven) , baked the remaining 4 ramekins for another 5 minutes (so they cooked for 25 minutes in total, then I removed 2 more ramekins from the oven) and cooked the final two ramekins for a further 5 minutes, so they cooked for 30 minutes in total. The perfect ones for us were the ones that cooked for 25 minutes. I found it to be a lovely ratio between pudding and sauce, the 30 minute ones were great also. And if you have any leftover ones, they thicken in the refrigerator and you get a lovely fudgy brownie type dessert that is delicious the next day. I used almond meal in my recipe as that is what I had at home, but the original recipe used hazelnut meal, so use whatever you prefer. And the chocolate sauce, delicious. When it hits the cold ice cream, it starts to set like store bought ice magic topping. I love it! The first time I made it I realised I had no cream in the refrigerator, and as I didn't feel like going to the store, I used vanilla ice cream instead, and it worked, so if you like, try it this way. 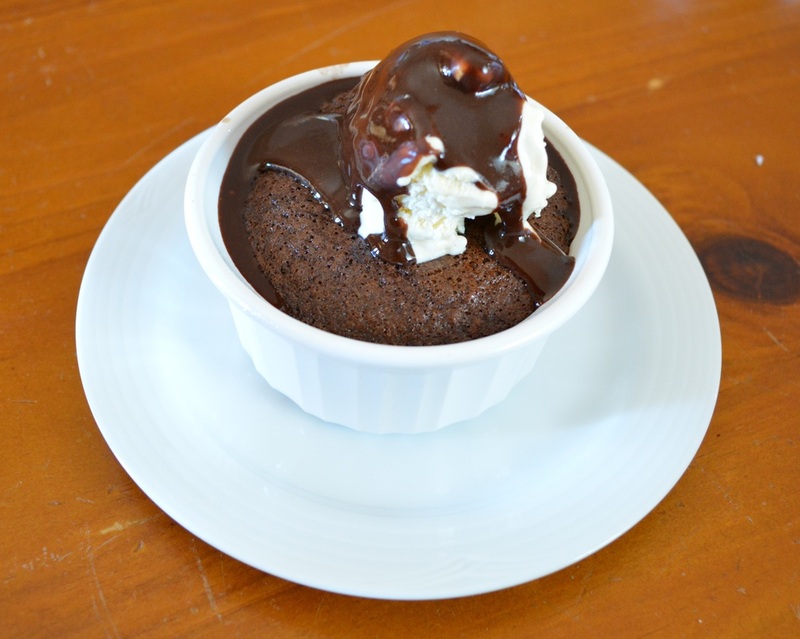 So for all you chocolate lovers out there, here is a delicious dessert to try that is very easy to make and your family and friends will love. Lightly grease six 2/3 cup (160ml) ovenproof dishes and place on an oven tray. Combine milk, chocolate, butter, hazelnut spread and cocoa in a saucepan over low heat. Cook until the chocolate melts and the mixture is smooth. Cool while you prepare the dry ingredients. Place the flour, almond meal, caster sugar and 2 tablespoons of the brown sugar in a large bowl. Whisk in the chocolate mixture and the egg until just combined. Pour among your ramekins, I use a ladle as a measure. Combine the extra cocoa, the remaining brown sugar in a jug. Add the boiling water and stir to combine. Pour evenly on top of the chocolate batter. I like to pour it over the back of a tablespoon into the ramekins, so that it disperses the flow and it doesn't go into the batter, but sits on top. Cook for 20-30 minutes or until the puddings rise and are just cooked through. I do like to cook it for 25 minutes. Remove from the oven and allow to cool slightly. To make the chocolate sauce, combine the butter, chocolate, hazelnut spread and cream in a saucepan, stir over low heat for 5 minutes or until the chocolate and butter melt and the mixture is smooth. 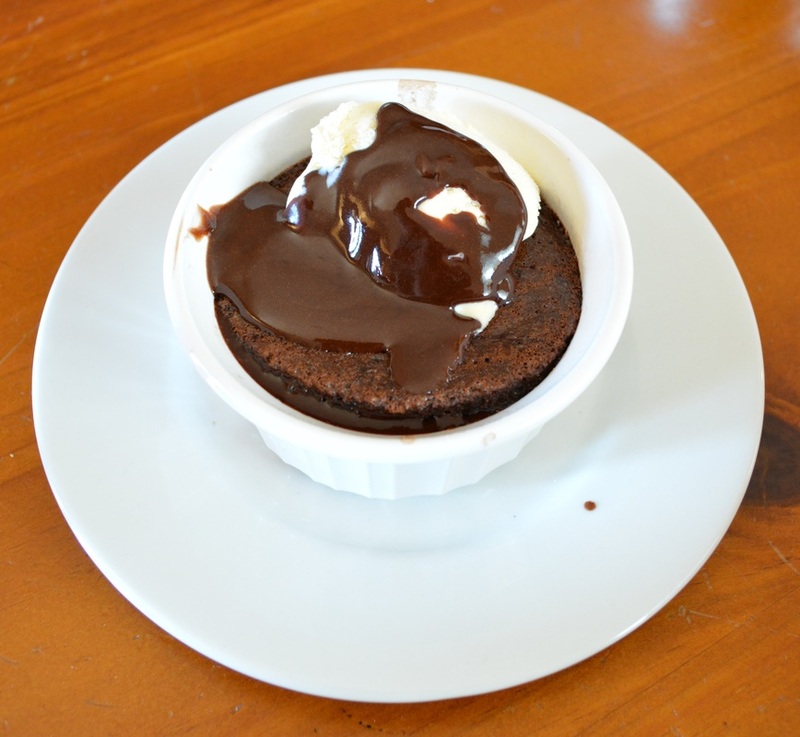 To serve, top the warm puddings with ice cream and drizzle with the chocolate sauce.